Handy Backup features an integrated FTP client which allows interacting with remote servers and transferring data in both directions. Through its use, you can easily back up data from FTP server, or store your backups to remote FTP folder. Offsite server backup can be useful, for example, when you back up a website which you have access to via FTP. 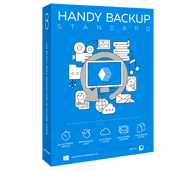 Handy Backup allows to retrieve data from FTP server and store it to any local media or networked storage. The Backup from FTP feature and capability of fast data recovery helps you avoid loss of data and expenses incurred due to server downtime. In case of necessity, recovery of data backed up from FTP can be started with a single click. Download our software and start backing up from FTP locations today! Free 30-days trial! Backup tasks in Handy Backup can be built of data of different types. Data selection is done through the use of plug-ins (Disk Image backup, MS Exchange backup and other), presets (My Documents backup, Desktop backup, etc.) and “common” file and folders selection. Selecting the Backup from FTP option during task creation calls a dialog which allows specifying host name, login information and provides a comprehensible way of selecting remote FTP folders. Proxy settings. Handy Backup enables you to back up data from FTP servers from behind an FTP, SOCKS5 or SOCKS4 proxy server. Secure password transferring. To transfer authorization information, the utility exploits MD4/MD5 cryptographic functions that are widely used in different fields of computing (e.g. in SSL protocol) and provide high reliability. Variety of options. FTP backups can be compressed, encrypted and assigned a time stamp, and all tasks can be scheduled for any day and hour and automatically repeated with any period. For a full list of features, please refer to Handy Backup Features. With Handy Backup backing up remote data from an FTP server is very easy!